This study was designed to determine the response of Escherichia coli to three different nutrient sources. In this study, E. coli was exposed to concentrations of ammonia as ammonium chloride and nitrate as sodium nitrate at 0.5, 1.0 and 2.0 mg/L; and reagent grade urea at 10, 20 and 30 µg/L using bacterial concentrations of 10−1, 10−2 and 10−3 per ml. Cultures were incubated for 24 h at 37 °C. Samples were analyzed using a LACHET™ (800 Series) for ammonia-N, Nitrate-N and Urea-N which was converted to molar concentrations. Growth rates for E. coli were determined using serial dilutions, incubated on 3 M™ Petrifilm™ for 24 h at 37 °C with colony counts taken. The results showed that E. coli was able to utilize both ammonia and nitrate, with ammonium utilization significantly greater than nitrate. Ammonium utilization was directly proportional to concentration of ammonium chloride added and to some degree, the initial number of bacteria exposed. 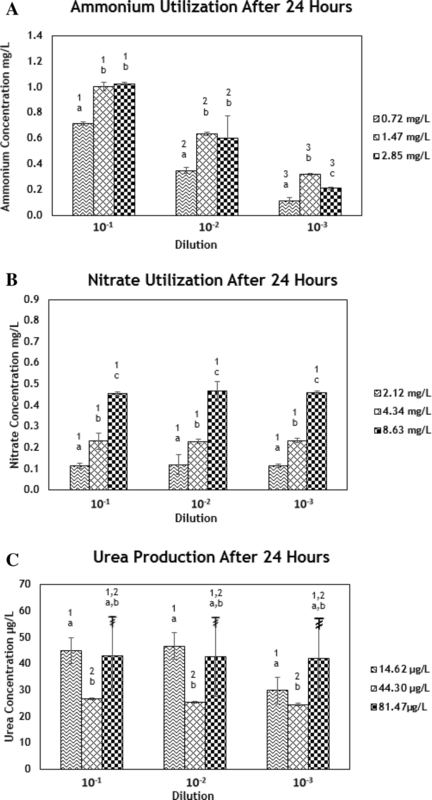 Nitrate utilization occurred at all concentrations and dilutions when compared with control concentrations and corresponded with concentrations of nitrate, but there was very little difference between bacterial dilutions. Urea production did occur but was unaffected by either concentration of urea or bacteria dilution. Positive growth rates were seen with ammonium with increasing growth rates as ammonium chloride concentrations were increased. Urea appeared to cause a slight decrease in growth, but nitrate was inconclusive with regard to growth. Historical, and in many cases current, practices by agriculture is the use of animal manures as a source of nitrogen (Brooks et al. 2015). On the Delmarva Peninsula, poultry litter has been and is currently a primary source of fertilizer (Han et al. 2015). Since all manures contain both pathogenic and harmless bacteria, the practice results in the additional loading of bacteria to the soil which has been shown to alter community diversity (Chu et al. 2007; Lv et al. 2017). The effect that this may have on nitrogen cycling is uncertain as few studies are available that addresses specific bacterial response to nitrogen sources (Geisseler et al. 2010) and conversely the effect of manures and nitrogen sources on community structure is rarely available (Enwall et al. 2007). At present, we are applying metagenomics to understand the response of microbial communities to changes in agricultural practice and transcriptomics to examine the potential effect on community function (Yergeau et al. 2015; Abreu and Taga 2016). Concurrently and specific to this paper, we are isolating bacteria from agricultural drainage ditches for use in determining their response to nitrogen sources. It is felt that using these two approaches will allow for a better understanding of how changing agricultural practices may affect microbial communities and the implications for water quality (Guo et al. 2014). There is little dispute regarding the role of bacteria and other microbes in the cycling of nitrogen in soils, water or sediments (Stein and Klotz 2016) and the important role they play in agricultural systems including sediments of agricultural drainage ditches (Maeda et al. 2011; Kostadinova et al. 2014). With increased reliance on amended nitrogen either as ammonia-N, nitrate-N, or urea-N the environmental impacts due to ground and surface runoff are well documented (Wang et al. 2012; Zhou et al. 2013). Many approaches to remediate the problem have been attempted and are based on providing carbon as a source for bacterial growth (Christianson et al. 2017). On the Delmarva Peninsula, poultry litter has been the primary fertilizer for corn and other crops (Howarth et al. 2002; Glibert et al. 2006), and contains Urea-N at 3% by weight on the average (Bolan et al. 2010). Nationally, there has been a shift from use of ammonia-N, nitrate-N, or poultry litter to synthetic urea-N due to economic and legislative pressures (Cahill et al. 2007; Gao et al. 2014). The effect of changing nitrogen source and the long-term impacts of artificial fertilizer and animal manures on sediments and water in drainage ditches are not clearly understood. However, studies have shown that community structure does change due to shifts in type of nitrogen source and method of application (Wang et al. 2012). For this study, we have chosen Escherichia coli because recent surveys on the Eastern Shore of the Delmarva Peninsula have shown that E. coli is a frequent isolate in surface waters and ditch sediments adjacent to agricultural fields (unpublished data). E. coli is easily grown and used experimentally under a variety of conditions (Williams and Marco 2014; Côté et al. 2016). It is a facultative anaerobe present in the guts of many vertebrates (O’Toole 2011; Babujee et al. 2012) and in particular present in poultry litter (Metcalf et al. 2014) which is the primary source of fertilizer for the Delmarva Peninsula (Pechal et al. 2014; Kleinman et al. 2015). The role of E. coli in the nitrogen cycle is uncertain (Shimizu 2013; Wang et al. 2017), but it is an ubiquitous environmental bacterium known to be urease negative (Konieczna et al. 2012) but, under some conditions shown to be urease positive (Zhang and Chen 2015). It has been shown to be highly plastic genetically, altering its ability to utilize nitrogen under changing environmental conditions (Grossman et al. 1993). However, most studies have been conducted in the guts of vertebrates and few have been conducted on E. coli as an environmental microbe (Allison et al. 2014). The purpose of this study was to evaluate the response of E. coli to media consisting of water and three different nitrogen sources. A pure culture of E. coli was obtained from the American Type Culture Collection (ATCC® 25922™) and stored at University of Maryland Eastern Shore (UMES). The sample was thawed and inoculated in 10 ml of buffered peptone water (BPW) and incubated, at 37 °C for 24 h and used for this study. Tenfold serial dilutions of E. coli from the stock solution were made ranging from 100 to 10−10 with 1.0 ml from each dilution plated on 3 M™ Petrifilm™. The Petrifilms were incubated at 37 °C for 24 h and colonies counted using standard plate count method to create a dilution curve. To determine the effect of each nutrient on growth 1.0 ml was taken from each treated tube, incubated at 37 °C for 24 h then plated on Petrifilm™ with the film incubated at the previous temperature and time and colony forming units (CFU’s) enumerated. The CFU’s were then used to measure the amount of growth. In those cases where the number of bacteria were too numerus to count (TNTC) or had no growth the data is not reported. Growth is reported for the bacterial dilutions of 10−1, 10−2, 10−3 and 10−4 only. At the 100 dilution CFU’s were TNTC and at dilutions above 10−3 no CFU’s were seen. The dilution curve samples were without nutrient, nutrient addition and used as controls for growth comparisons. Based on previous work with the E. coli growth, we used dilutions of 10−1, 10−2 and 10−3 bacteria per ml. For nitrogen source, we used concentrations of 0.5, 1.0, and 2.0 mg/L ammonium chloride which resulted in 0.59, 1.14 and 2.21 mg/L ammonia-N, respectively. This was then converted to molecular ammonium yielding concentrations of 0.72, 1.47 and 2.85 mg/L ammonium. Sodium nitrate was also used at concentrations of 0.5, 1.0, and 2.0 mg/L and converted to molecular nitrate resulting in concentrations of 2.12, 4.34 and 8.63 mg/L nitrate, respectively. Urea as Ultra Urea™ (Invitrogen Inc., Massachusetts, USA) at concentrations of 10, 20 and 30 mg/L urea resulted in urea-N at 3.3, 10.0 and 19.0 µg/L urea, respectively. When converted to molecular urea with the resulting concentrations of 14.62, 44.30 and 81.47 µg/L, respectively. These concentrations are consistent with those observed in the field (Kibet et al. 2016; King et al. 2017). Controls for each nutrient and nutrient concentration without bacteria were also analyzed. These controls served as internal standards during analysis. All exposures were in triplicate and tubes incubated at 37 °C for 24 h. The 24 h incubation time was chosen as E. coli is known to be in its stationary phase after 16 h and thus this would represent the maximum concentration of organisms per ml at the time of counting (Chubukov and Sauer 2014). After 24 h all tubes were placed on ice to arrest further activity and taken to the Nutrient Management Laboratory where they were agitated and split into two sub-samples. The first was filtered using paper filters (0.45 µm) for ammonia-N and nitrate-N analyses and the second with glass filters (0.45 µm) for urea-N. Filtered samples were stored at 4 °C and analyzed within 24 h of collection. The concentrations of, ammonia-N, nitrate-N and urea-N were determined on filtered samples using a LACHAT™ QuickChem (800 series) method 10-115-01-1-A. Utilization for the 24 h period for ammonium and nitrate were calculated by subtracting the final concentration from the control concentration. Production for the 24 h period for urea was calculated by subtracting the control concentration from the final concentration. All results are reported as molecular concentrations of ammonium, nitrate and urea. The data were assessed by two-way ANOVA using a 4 by 3 factorial design (version 6.0, Prism, GraphPad Software, San Diego, CA). To better understand these interactions, two means comparison tests were done. When the final concentrations of ammonium were subtracted from the control, it showed that E. coli utilized ammonium. The amount of ammonium utilized correlated with bacterial dilutions and ammonium concentrations in the media between 0.72 and 1.47 mg/L where utilization increased, but between 1.47 and 2.85 mg/L there was no significant difference (Fig. 1a). At molar concentrations of ammonium of 0.72, 1.47 and 2.85 mg/L the amount of ammonium utilized at 0.72 mg/L was 0.72 ± 0.01, 0.35 ± 0.02 and 0.11 ± 0.02 mg/L at dilutions of 10−1, 10−2 and 10−3, respectively. At 1.47 mg/L utilization was 1.00 ± 0.32, 0.63 ± 0.02 and 0.32 ± 0.01 mg/L of ammonium and at 2.85 mg/L of ammonium utilization was 1.03 ± 0.01, 0.60 ± 0.18 and 0.21 ± 0.09 at bacterial dilutions of 10−1, 10−2 and 10−3, respectively. After 24 h, colony counts for dilutions of 10−1 was TNTC at all concentrations of ammonium. At 10−2 colony counts were 230, 360 and 430 CFU’s at concentrations of 0.72, 1.47 and 2.85 mg/L ammonium in the media, respectively. At 10−3 CFU’s were 39, 45 and 57 at the above concentrations. At 10−4 and 10−5 colony counts were too low to be meaningful. This suggests that ammonium may have a positive influence on E. coli growth. These findings are consistent with those of other authors (Peterson et al. 2005; Shimizu 2013; Brown et al. 2014; Wasik and Chmielowski 2017) where E. coli was able to reduce ammonium concentrations under varying conditions. 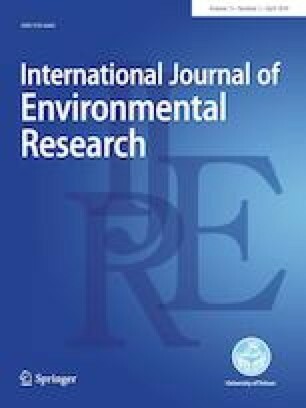 For example, Wasik and Chmielowski (2017) demonstrated that in filter material used for domestic sewage filtration, ammonium reduction by E. coli was observed, but not to the degree as seen in this study. Nygaard et al. (2006) clearly demonstrated that because E. coli had the ammonium transporter B (AmtB) protein it was capable of assimilating ammonium. This was further supported by Yuan et al. (2009) who demonstrated that E. coli was able through a variety of enzymatic pathways to assimilate and incorporate ammonium in many of its proteins, particularly glutamate. Most of the studies were related to animals and sewage and not E. coli as a constituent of the environment. The results from this study would suggest that as a constituent of the sediment microbial community E. coli would be involved in the conversion of ammonium to amino acids and that ammonium appeared to promote growth. When sodium nitrate was added to the medium the final concentrations were 2.12, 4.34 and 8.63 mg/L nitrate. However, after bacteria were exposed there was a marked decrease in nitrate but no significant difference between bacterial dilutions (Fig. 1B). At 2.12 mg/L utilization was 0.11 ± 0.00, 0.12 ± 0.04 and 0.12 ± 0.02 and at 4.34 mg/L utilization was 0.23 ± 0.37, 0.23 ± 0.09 and 0.23 ± 0.01 mg/L. At 8.63 mg/L utilization was 0.45 ± 0.12, 0.47 ± 0.05 and 0.46 ± 0.01 and growth data for E. coli was less consistent than that seen with ammonium. At 10−1 the CFU was TNTC at all nitrate concentrations. At 2.12, 4.43 and 8.63 mg/L CFU’s were 430, 260 and 540, respectively, for 10−2 bacterial dilution while at 10−3 was 32, 46 and 105 CFU’s. At all concentrations and bacterial dilutions there was a significant reduction in nitrate with coincident utilization of nitrate. In this study, this specific strain of E. coli did not show any variation in utilization between dilutions but did vary with exposure concentrations. It is known that specific strains of E. coli do vary in having nitrate reductase which is most active under anaerobic conditions (Potter et al. 1999). Similarly, authors have shown that anaerobic conditions may be important as triggers to nitrate reductase, hence nitrate utilization (Ishimoto and Yamamoto 1977; Noguchi et al. 1997; Whitehead and Cole 2006; Warry et al. 2008; van Beilen and Hellingwerf 2016). Again, the type of strain used may play a significant role as nitrate utilization is strain specific. Our concern is the lack of information for E. coli regarding its role in nitrate utilization. In this study, there is no indication that E. coli growth correlated with nitrate concentrations as the CFU’s fluctuated too much to draw any real conclusion. Urea concentrations were higher than controls suggesting that E. coli produces urea. When the control concentrations of urea were subtracted from the final concentrations resulting production after 24 h at 14.62 µg/L was 44.94 ± 133.65, 46.74 ± 133.26 and 29.81 ± 82.33 µg/L at dilutions of 10−1, 10−2 and 10−3, respectively (Fig. 1c). Urea production was lower at 44.3 µg/L with production of urea at 26.80 ± 0.36, 25.39 ± 1.28 and 24.57 ± 4.10 µg/L at 10−1, 10−2 and 10−3, respectively. At 81.7 µg/L urea production was 42.87 ± 4.99, 42.66 ± 3.49 and 42.19 ± 3.27 at bacterial dilutions of 10−1, 10−2 and 10−3, respectively. E. coli growth on Petri films for urea at 10−1 was TNTC. At 10−2 CFU’s were 372, 372 and 411 at concentrations of 14.62, 44.30 and 81.47 µg/L urea, while at 10−3 CFU’s were 40, 1 and 2. Below the 10−3 dilution CFU’s were too low to be meaningful. At all concentrations of exposure there was urea production. It has been shown that under some conditions E.coli will produce urea (Morris and Koffron 1967; Tuchman et al. 1997). This study confirmed previous studies that urea is produced. While, between 14.62 and 44.3 µg/L urea in media there was a decrease at all bacterial dilutions in urea production. This could represent a negative feedback with the higher concentration of urea slowing production. This is consistent between all bacterial dilutions. However, between 44.3 and 81.47 µg/L urea production significantly increased with the higher concentration. When it was exposed to 81.47 µg/L urea there was a significant fluctuation in urea production which makes these results somewhat unreliable but still shows urea production at this concentration. There is some suggestion urea decreases E. coli growth but the evidence is not strong. It has been shown that urea is toxic at higher concentrations (Muema et al. 2015; Soman et al. 2017) and thus the possibility exists that our exposure rates caused a reduction in growth which also may influence any utilization of urea. The results of this study clearly show that as a potential environmental microbe E. coli utilizes ammonium and that utilization corresponded to concentrations of ammonium and the number of E. coli per ml of media. On the other hand, E. coli utilizes nitrate but that neither concentration of nitrate or bacterial dilution appear to affect the amount of utilization. Urea was produced by E. coli under the conditions of this study. In the case of urea there was some suggestion that growth was diminished but these results are not conclusive. The implications of this study are that bacteria can be exposed to varying nitrogen sources and conclusions drawn regarding their potential role in the environment, as well as the effect of specific nitrogen sources on E. coli growth. In this case, it is important to know the potential role of E. coli as we continue to construct systems designed to reduce nitrates in agricultural ditches. The authors thank the urea project funded under the USDA-NIFA Grant # 2015-38821-24380 for the financial support for this study.